Above is a photo of Diplocentrus spitzeri a rarely seen scorpion found at medium elevations in southern Arizona. This scorpion species and the Diplocentrus peloncillensis are the only scorpions of the family Scorpionidae found in Arizona. 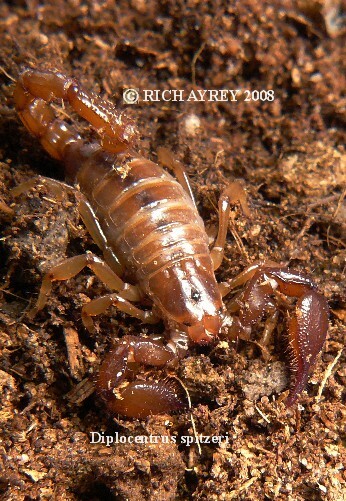 They are both found in remote areas, which is why these scorpions are rarely seen. I am fortunate to have available pics of both these Arizona Scorpions. Arizona Scorpion World created 06/03/08.